Here we go again, Zac Efron in another high school-themed movie where he is a star of the basketball team. How different could this movie be from all the "High School Musical" films? No doubt, this movie will appeal to kids and teenagers all over the world because of Efron, but could it also click with the rest of us? Could Efron finally prove that he can do well in a movie without all the singing or dancing or would we wish that he’d rather just stick to cheery, Disney films? The year is 1989 and Mike O’Donnell (Zac Efron), a High School Senior and captain of the basketball team seemingly has a bright future planned out for him: a good chance to play basketball with a college scholarship. That is until he finds out that he has gotten his high school sweetheart pregnant and blows the game of his life - he opts to forego his college dream, marry and start his own family. Fast forward 20 years, we see Mike (Matthew Perry) frustrated by his career, in the verge of a divorce and hated by his daughter and son. Still not over thinking of what could have been if he made a different decision when he was 17, he finds himself waking up and being back to his 17 year old self. Mike now has a second chance in life - can he fix his family and his life even in his 17 year old image? Although we are not exactly fans of Zac Efron (or his abs), we can say that this movie took us by surprise. Yes, there are just so many movies with body switching themes: "Freaky Friday" and "13 Going on 30" just to name a few. But this one is definitely one of our favorites because of several reasons. First, it delivers its moral story well. The movie sort of reminds us of "Click" when it comes to delivering its family-value moral story. Second, we can say Efron can pretty much stop doing the song and dance movies where he first got known for. His acting was pretty good and we can definitely see a bright future for this young man when he eventually stars in romantic comedy films or as he takes more serious roles. Lastly, we love the strong supporting cast in this movie, particularly from Thomas Lennon who plays Mike’s best friend Ned. His notable performance and witty lines definitely made the movie more enjoyable and he might even gotten some limelight from Efron in this regard. Over all, this movie, even though very predictable, is pretty good and will be worth your time. 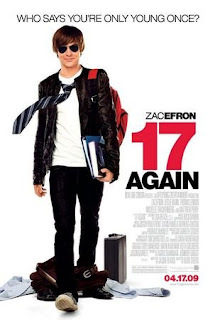 - Zac Efron is in this movie! - Thomas Lennon just steals the show by being very funny! - If you’ve seen too many of this type of film like "Freaky Friday"
By the way, if you want to have a chance to win some SM Cinema Complimentary Passes, go to our anniversary post and find out how!